With over 25 years of clinical experience she has helped many patients who have struggled to get a diagnosis and a solution to their problems. Alison has lectured in clinical diagnosis and treatment, and worked as an external examiner for clinical competence exams. With the senior level of experience and longer consultation times you will find Alison's consultations, treatments and clinical extremely cost effective. Whilst Alison helps people from all walks of life her speciality is in helping musicians, actors and singers. 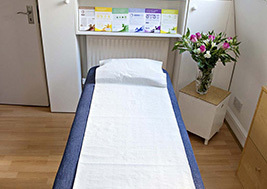 Osteopathy is a statutorily regulated primary health care profession. This means you have the same level of assurance as consulting a dentist or doctor; you do not need a GP referral to attend. Clinical and academic training lasts several years at university and this alongside over 25 years iin practice has given Alison a wealth of experience in clinical diagnosis and treatment. When a different type of treatment would be more appropriate for you, you will always be referred to your GP or most appropriate health professional ensuring you always receive the most appropriate clinical care.